Takeaway: Slogans reinforce safe attitudes and equip workers to make the right choice even when they must act quickly. There's so much going on in every workplace that it can be hard to keep safety in constant focus. Safety slogans provide powerful messages and reminders that are short and easy to remember. A safety slogan works like the chorus of a radio hit single: the message is catchy and seen or heard repeatedly, which makes it stick in every worker's mind. Understanding the purpose of a safety slogan is helpful when determining which will be most effective. Here are twenty of the most effective common slogans that can help make your safety messages unforgettable (to make sure no one misses them, learn How to Master the Science of Sign Visibility). It can sometimes seem like success, productivity, and efficiency are at odds with safe work practices. It's critical to remind workers, then, that work done unsafely is never work that is done successfully. Productivity and quality follow from safety – they don't come at the expense of it. Safety affects every individual, but it's a collective project. Everyone in the workplace needs to be involved, not only the supervisors and safety officers. But when workers observe unsafe work practices or conditions, they might not always feel confident about intervening, especially if they fear reprisals or other negative consequences (find out How to Encourage Employees to Report Workplace Hazards). By reminding workers that they should "Dare to Care," employers let them know that reporting and raising concerns is not only acceptable – it's encouraged. 3. "Hear Today, Gone Tomorrow"
People who work with heavy equipment and power tools sometimes get used to the noise. But that doesn't mean they become immune to it. The ramifications of both short- and long-term exposure to high noise levels can be serious, but they're often only detected years after working around noise hazards. When it comes to managing risks, many workers focus on those that result in acute injuries and illnesses, but neglect those that lead to chronic conditions later in life, including noise-induced hearing loss (learn more about Noise: The Safety Hazard 22 Million Workers Are Exposed to Every Year). Giving workers and quick and pithy reminder that their hearing and well-being are on the line makes it more likely that they will wear hearing protection. 4. "Plan the Work, Work the Plan"
We all know safety doesn't happen by accident, so it's important to thoroughly plan work activities to ensure that all risks are managed. But workers, especially once they get comfortable with their job, can sometimes go "off script" and deviate from that careful planning. This slogan reminds them that the plan is there for a reason: to avoid facing hazards workers are not fully prepared to deal with. 5. "A Harness Is Better than a Hearse"
The chances of being fatally injured from a fall are high, even at heights that don't seem very dangerous. 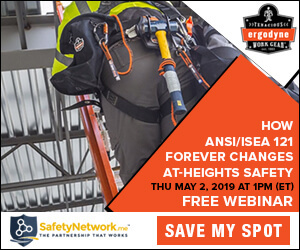 When workers choose not to wear their fall protection equipment (or don't take the time to inspect or properly don it), they are taking on an extreme risk. Reminding them that their fall protection gear might very well save their lives could make all the difference. 6. "Tell Me – I Forget. Show Me – I Remember. Involve Me – I'm Committed"
We should never forget the power of coaching and mentorship. Most of us don't respond all that well to being told what to do, but we're very receptive to emulating others and learning by example (learn about Enhancing Safety Culture through Mentorship Programs). This slogan reminds supervisors and co-workers alike that taking the time to demonstrate something – including safe work practices – makes it far more engaging than simply giving a set of instructions. 7. "Your Good Health Is Your Greatest Wealth"
If you're fortunate, you have decades of your life ahead of you. Whether you spend those in good health or suffering from health conditions will make a big difference to your well-being. But too often, we tend to focus on the physical dangers in the workplace and forget about protecting our health. The thought of getting our hand caught under a circular saw is viscerally frightening, and we take steps to make sure it doesn't happen. It's easier to get complacent about the risk of developing a respiratory condition from exposure to toxic fumes. Slogans like this one help workers keep these long-term and often invisible health hazards in mind. 8. "When You Gamble with Safety, You Bet Your Life"
It would be easy to get workers to strictly follow safety protocols if there was a 100% chance of injury with every incident. But most of the time, workers engaging in unsafe work practices will emerge unharmed. So, they'll often weigh the odds and take risks ("If I don't do the Lockout/Tagout procedure, probably no one will get hurt"). But even when there's a low probability of harm, it can happen at any time. This slogan reminds workers that unnecessary risks aren't worth taking. When the outcome could be serious injury or death, play it safe and never roll the dice – no matter how good the odds seem. 9. "Accidents Hurt – Safety Doesn't"
Hazard control measures, including PPE and protective clothing, might seem inconvenient at times. But that small downside is nothing compared to the hurt and suffering (both physical and emotional) that comes with serious injuries or occupational illnesses. Accidents, moreover, don't just hurt injured workers. They also have a lasting impact on their families and colleagues. When you take a good, hard look at the downsides, there's just no comparing the two: safety is always the least painful option. 10. "Broken Tools Can Be Replaced - You Can't"
When they're dealing with defective or damaged tools, workers shouldn't just "power through" and try to use them anyway. Doing so could result in anything from a minor cut or bruise to a fatal injury. When an inspection reveals that a tool is broken, it needs to be take out of service immediately. If it can't be repaired, it must be replaced, even if the work cannot continue without it. 11. "A Wound Neglected Is a Wound Infected"
Treating wounds properly and immediately ensures they're not exposed to bacteria or toxic substances that could lead to infections or other complications. Delaying first aid treatment until the break or until a task is finished could give rise to serious problems where there would otherwise have only been a minor injury (learn more about Managing the Risk of Infectious Diseases in the Workplace). 12. "Stay Alert – Don't Get Hurt"
Distraction and hazards are a dangerous combination. It just takes one careless or inattentive action to put someone in harm's way. By staying vigilant, workers can make sure they're not caught off-guard by existing or newly introduced hazards. 13. "Being Pro-Active Means You Don't Have to Be Reactive"
Being proactive about workplace safety means taking the time to identify hazards, determine the best way to approach and mitigate them, and predict and prepare for risky events that could occur. All of this reduces the likelihood of an incident taking workers and employers off-guard, forcing them to be reactive. What's being reactive? It means dealings with hazards as they arise, not before they do. It's sometimes necessary, but it's rarely effective, efficient, or even safe, so it's always best to be prepared. 14. "Use Your Brain and Avoid the Strain"
We tend to think of lifting and carrying heavy objects as something that makes use of our muscles. On that view, doing it well just means having the brute strength to carry more weight. But lifting well doesn't just take muscles. It also takes smarts. Your body is a tough and complicated machine, but it's also a sensitive one. Put your muscles through too much, lift with the wrong posture, or carry a load the wrong way and you could put some of your muscles out of commission. Workers who lift smart instead of lifting carelessly can avoid debilitating musculoskeletal injuries. 15. "If You See Something, Say Something. If You Say Something, Do Something"
Bringing safety concerns to supervisors and employers can be uncomfortable and awkward. But it's imperative that these issues are addressed immediately. Spreading the word is important. But we all know that actions speak louder than words. There should be appropriate and adequate follow up on every issue that is brought forward. This slogan reminds workers and supervisors alike that they can't make a difference by keeping their concerns to themselves. 16. "Safety Is About Doing the Right Thing – Even When No One Is Looking"
Penalties for risky behavior is sometimes necessary. But safety isn't about avoiding punishment; it's about everyone's right to work without suffering avoidable harm. This slogan reminds the workforce that it's every employee's duty to uphold safety in the workplace. 17. "Behind the Wheel, ANGER Is Only One Letter Away from DANGER"
We hear more about distraction than so-called "road rage" nowadays, but anger behind the wheel is still a serious issue. Whether they're behind the wheel of the company vehicle or going home after work, employees who get angry when they're cut off in traffic, stuck behind a slow-moving vehicle, or frustrated by roadwork delays can lose some of their capacity to make sound judgment and act responsibly. Driving is stressful. Everyone can use a reminder to remain safe and calm. 18. "Electricity Can Turn You Off"
We all know that electricity is dangerous. But the risks go beyond getting a painful electric shock. The full list of dangers include physical burns, neurological and psychological damage, and ventricular fibrillation (a type of arrhythmia that can result in cardiac arrest). Knowing and understanding these risks is a major part of working safely with electricity. 19. "Avoid a Scene and Keep Your Workplace Clean"
Housekeeping isn't just for the home. In fact, poor housekeeping is one of the leading causes of workplace incidents. All work areas should be kept reasonably neat and clear. When clutter, debris, and spills are the norm, so are slips and trips. 20. "If You Mess Up, Fess Up"
It can be hard enough to bring concerns to a supervisor. It's even worse when it's something you've done. But keeping quiet can be a hazard in itself. Covering up mistakes, failing to report accidents and near misses, and not alerting others to tools or equipment that have been broken puts everyone at risk (for related reading, see Near Misses: What They Are and Why You Should Report Them). Accountability is an important pillar of safety culture. When workers can trust each other to do the right thing, everyone feels safer. Workers constantly have to make split-second decisions. They don't have time to run through the entire safety program before choosing a course of action. But by promoting a few key safety slogans, employers and safety professionals can equip their employees to make the right choice even when they have to act quickly. Sherri Carriere has been assisting organizations in conducting successful business operations through the identification and management of risk exposures to ensure regulatory compliance for over 22 years.